When it comes to documentaries, National Geographic are up their with the best and whether it’s history, science or life, they have been the forefront of returning easily digestible chunks of information back to the general public. Merging engaging information with visually stunning cinematography, re-enactments and CGI, Egyptian Secrets of the Afterlife revolves around one of the worlds most popular and mysterious civilizations who believed in a strange assortment of deities from Anubis, the Jackal headed god to the green skinned Osiris, another god of death who was murdered by his evil brother Seth. The documentary follows Pharaoh Seti the 1st as he battles one of the most arduous journeys of his life from mummification to the various tasks and monsters that he must face during his road to eternal rest. This film revolves around the after life of the Egyptian and in order for the person to pass successfully to the afterlife, their family and priests needed to ensure that their ceremonies and sacrifices were accurate or they could face permanent death without any chances of resurrection. Needless to say, it was a terrifying premise for the ancient Egyptians and this documentary goes into great depths of how their dead would travel to the next life, both here and in the afterlife with the sun being their guiding force. 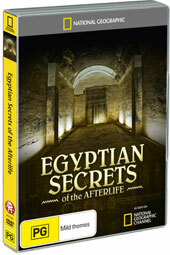 From expert interviews to re-enactments and gorgeously presented footage of artefacts and tombs, Egyptian Secrets of the Afterlife is not just a rehash of older information about this civilization and actually reveals more information on the process, especially by their god kings and the pharaohs whose tombs were actually resurrection machines that dictated how their lives would unfold in the afterlife. Another interesting aspect of this documentary is the engaging mythology of the various gods and goddesses that were worshipped by the Egyptians and also the very dangers that their spirits faced in the afterlife from monsters to other spirits and of course, the judgement of the gods which was carefully captured in the Egyptian Book of the Dead. For Seti, this book was painted on his tomb in order for him to travel through the Egyptian realm of hell as he turns into the Sun God Ra and this is all done through the assistance of the priests. The reason why the Egyptians stocked their tombs with material goods and shawabtis, miniature dolls which looked like servants was to assist them in the afterlife, provided they made it through the chores of the gods. The documentary perfectly finishes with that of the sun which was the most powerful force for the Egyptians and their guide towards the afterlife. Brilliant from start to finish! This presentation is first class that features Dolby Digital 2.0 with crystal clear audio and glorious 16:9 widescreen that makes the artefacts and locales come alive. There is a little bit of grain but this is understandable for DVD. Nonetheless, it's extremely good for this format. Apart from the excellent main feature on this documentary, it also contains another documentary called Egypt’s Hidden Treasures that takes the viewer on an interesting journey through the Egyptian Museum in Cairo which brought back a wealth of fond memories to me when I did visit Egypt. Celebrating the museum’s anniversary and getting ready for the millennium exhibition, the curators take the viewer on an amazing journey beneath the Cairo museum. From relics to royal mummies and in-depth interviews from the staff, it also tells the viewer the techniques that have been used to discover the items, preserve them and displaying them for the public. Some items have not been seen for almost a hundred years and some of the items are quite strange, such as the sarcophagus of a shrew. This special feature nicely compliments the main documentary that I recommend that all viewers investigate.